My first few hours with Fitbit Ionic were horrid. Mind you, it wasn’t the device I had a problem with, but rather what I was doing with it. Before I received my review unit, Fitbit demanded that I test it first. Fair enough. What I didn’t know was that they really wanted to show off Ionic’s fitness capabilities. I did a mini boot camp with celebrity trainer Harley Pasternak, and a grueling bike ride with Tour de France veteran Jens Voigt. I opted out of the 8-mile run with ultra marathoner Dean Karnazes, but my legs hurt just thinking about it. When it was over, I learned two things: I’m terribly out of shape, and Ionic is a fantastic fitness band. Fitbit’s new wearable tracked every second of my workout, dutifully calculating calories burned and recovery heart rate, and even knowing when I inevitably had to stop from exhaustion. But once I took it home and integrated Ionic into my far more sedentary lifestyle, I learned something else: It’s not very good at being a smartwatch. Ionic is more like a wristwatch than other fashion-minded Fitbits such as Blaze and Surge, but it still has a definite fitness tracker aesthetic. 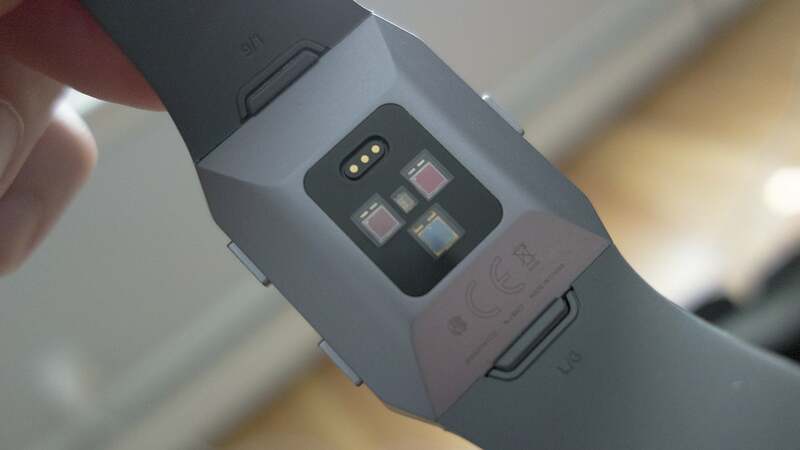 I was particularly impressed with the profile, which is several millimeters thinner than most other smartwatches due to its unique convex design for the heart rate sensor. Much of the bulk on Ionic is hidden when you strap it on. The body of the watch is square, with an aluminum enclosure that cradles its 1.42-inch rectangular LCD screen. Like Apple Watch, it doesn’t have always-on capabilities, but the screen is impressively bright and crisp, especially when wearing it outside. 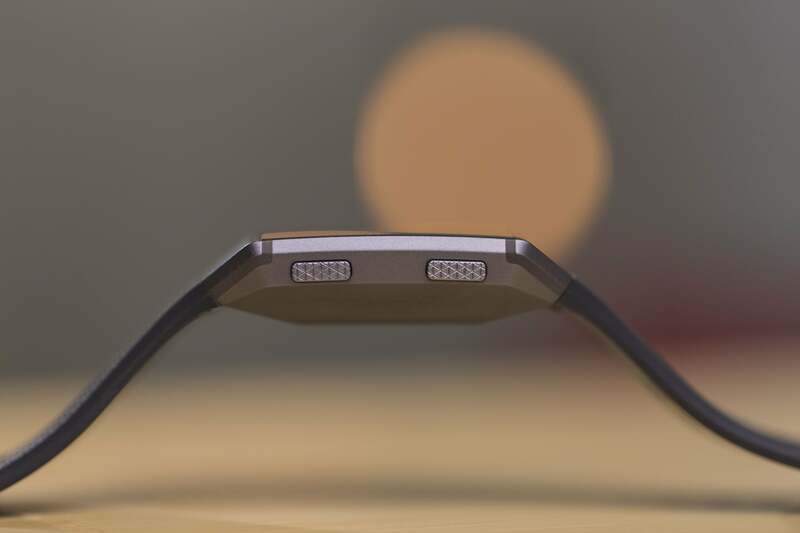 However, while the bezels are smaller than Blaze’s, Fitbit could have cut down on bulk even further by ditching its logo on the front of the device. There are three colors available—two shades of gray and burnt orange—and Fitbit has designed the body of the watch to naturally flow into the band so it looks seamless. 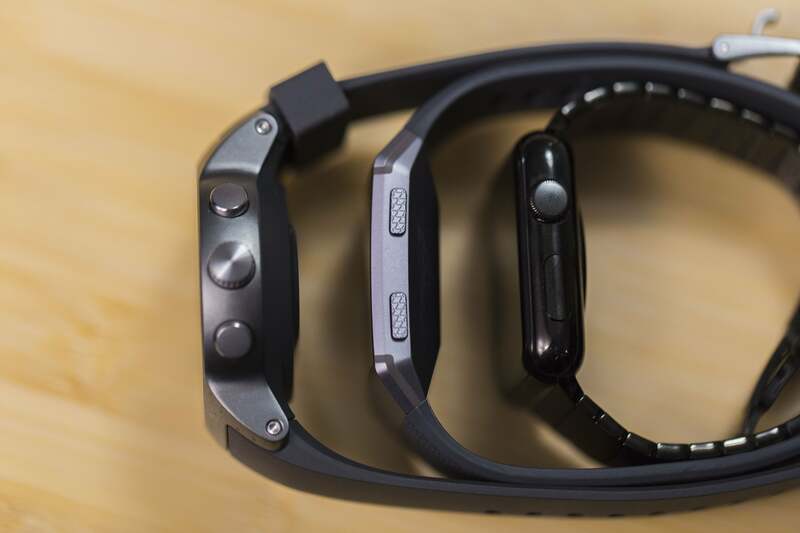 Like Apple Watch, you can easily change up the look with one of the bands for sale, and its super-simple strap-swapping system is the best I’ve used, even better than Apple’s slide-out method. When compared to the LG Watch Style (left) and the Apple Watch (right), Fitbit Ionic has a pretty slim profile. Ionic feels as solid as any Android Wear or Apple watch, and it’s comfortable enough to wear for days on end. That includes when you’re showering or swimming (or drenched in sweat from pushing a torque fitness sled with muscles you didn’t know you had). Like Apple Watch Series 3, Ionic is equipped with 50-meter water resistance, far greater than the common IP68 certification (which only protects against 1.5 meters of submersion). The biggest problem I had with Ionic’s design is one that’s hard to avoid: It’s still a Fitbit watch. I didn’t dislike the look as much as some of my colleagues, but there’s no denying that Ionic doesn’t feel as modern or fashionable as Apple Watch or even some of the better Android Wear watches. While the large color screen immediately conjures comparisons to Blaze, Ionic is quite a different animal. 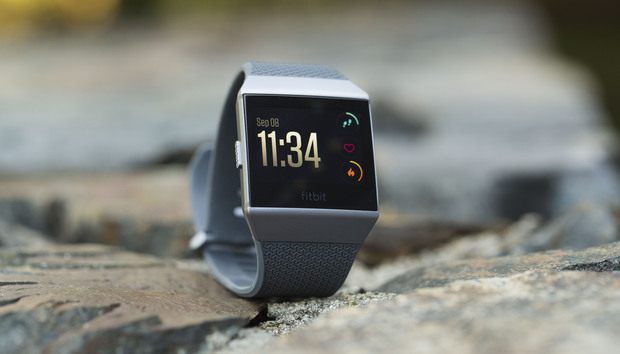 In fact, if you look at Fitbit’s lineup, you’ll see that Ionic is actually replacing Surge, and the $300 Blaze will continue to be sold as a cheaper alternative. Fitbit’s new tri-color heart sensor is constantly monitoring your BPM on Ionic. What Ionic strives to be is a smarter, fuller-featured version of Blaze. Both watches have an array of fitness sensors to track distance, elevation, and exercise, monitor sleep, guide your breathing, and count calories burned, but Ionic ups its game with even more fitness features. Most notably, Ionic has GPS, and there’s a new SpO2 sensor for estimating blood-oxygen levels, which Fitbit hopes to one day use to detect sleep apnea. And Fitbit has teamed with Dexcom to allow Ionic to monitor glucose levels through the under-the-skin G5 Mobile sensor next year. Even with all those sensors and functionality, Ionic has more than enough battery to power you through several days of workouts, an impressive feat for a smartwatch with such a slim profile. I was able to push my Ionic well into a forth day with light exercising, and even after my boot camp blitz, three full days wasn’t a problem. It’s a major advantage over the 18-hour battery life claimed by Apple Watch Series 3. Ionic’s premier fitness feature is a built-in training system called Fitbit Coach that offers quick visual instructions for a few different workouts. 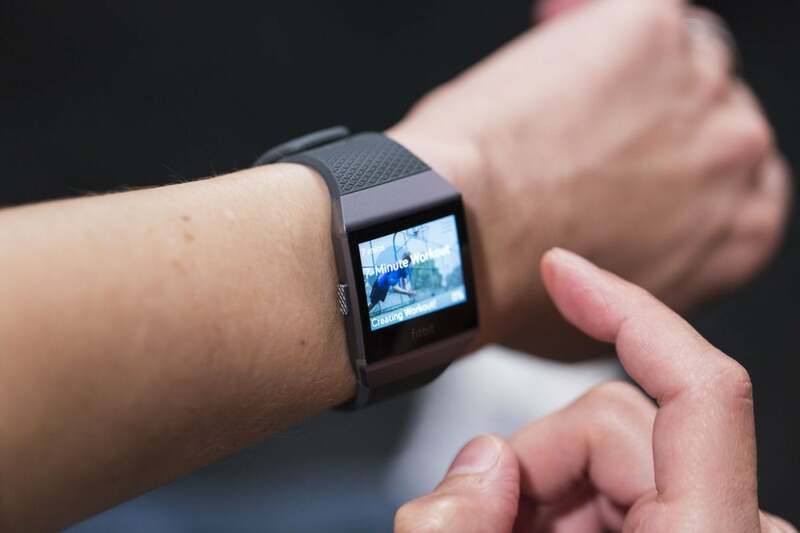 It’s part of a larger push by Fitbit to create a personalized fitness plan for each user. Having how-tos on the watch itself is a nice touch, and over time, they’ll adapt to your specific routines (or lack of one, as the case may be). With on-watch training, fitness is definitely where Ionic excels. It’s missing an audio component, which won’t be arriving until October, and even further down the line is a $40-a-year service that promises to construct a personalized, flexible lifestyle plan for sleep, exercise and nutrition, all on your watch. It’s ambitious and certainly distinguishes Ionic as the flagship Fitbit device, and it could end up being the killer Ionic feature once all the pieces are in place. 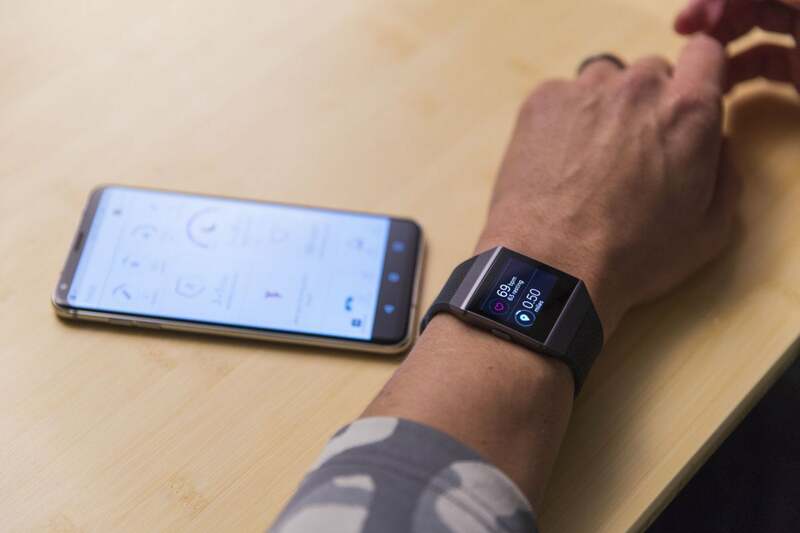 Even without the full fitness experience, however, the sensors and fitness features that are functional on Ionic are definitely a step above the activity tracking on Samsung, Android Wear, and even Series 3 Apple watches. From step counting to step training, Ionic tracked and tallied the exercises I did with precision, and the smart auto pause helped keep my numbers as accurate as possible. And once I was on my own, its constant prodding and praising did well to keep me motivated and stay active. Unfortunately for Ionic, nearly all of its smarts went toward fitness. While Fitbit boasts that Ionic is the company’s first fully functional smartwatch, it pales in comparison to even sensor-deprived, fashion-first Android Wear watches. The Fitbit app is the brains behind much of what Ionic does. Fitbit has leveraged its Pebble acquisition to create a brand new foundation for apps, and you’ll get a handful of them at launch: Weather from AccuWeather, Pandora, Starbucks, and Strava, along with a few stock Fitbit apps, including Exercise, Coach, Wallet, Timers, Alarms, Relax, Settings, and Today. That’s a pretty weak selection to start with, but it might be easier to overlook if any of the non-fitness-related apps did something useful. Aside from Timers and Alarms, which do what you’d expect, Ionic’s apps are frustratingly limited, with most offering single-page and in some cases, single-use functionality. For example, the Starbucks app is nothing more than a place to store your card. And the Wallet app (the logical place for your Starbucks card) merely offers instructions for how to make payments (by holding the left button). That’s right, Ionic includes an NFC chip for on-the-go payments. The means yet another payment service (Fitbit Pay, natch), and it works like any other: pull up a card and hold the screen up to a checkout reader. But you can’t add cards without the phone app and Ionic only stores one at a time. It’s clearly designed for athletes who want to leave their wallet behind when on a run rather than someone who wants to abandon cash and credit cards. You might have noticed a few key smartwatch apps that are missing from Ionic: messages, phone, mail, and maps. As it stands, you can’t do any of those things on the watch. Notifications will alert you to incoming messages and calls, but you’ll need your phone handy if you want to interact with them. It’s a very hands-off affair that might have been novel with the first Pebble way back when, but today’s smartwatches are much more than mere conduits for our phones. 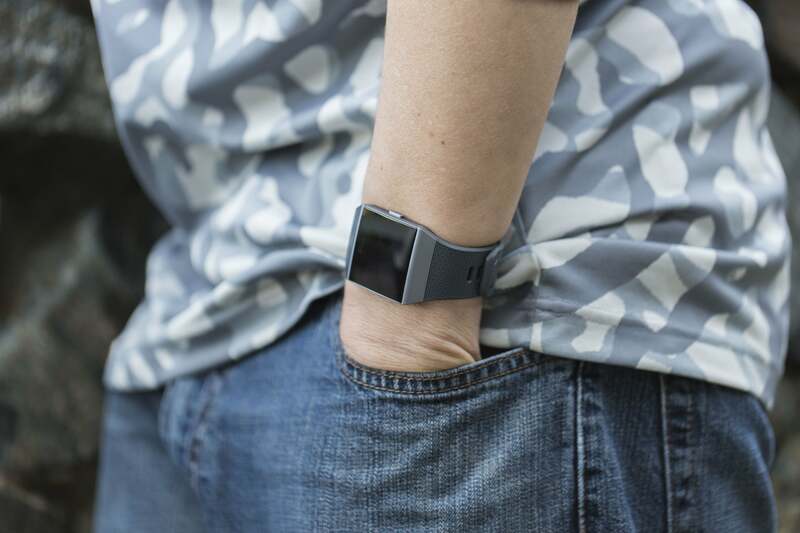 Most of Fitbit’s smarts are related to fitness. Clockfaces (as Fitbit calls them) leave much to be desired as well. While dozen are so that are available are bold and well-designed, you can’t personalize them much at all, and once again, you need to visit the phone app (available on iOS and Android) when you want to pick a new one. Customization is limited to colors, not complications, and there were numerous times when my watch displayed “clock error” before it loaded the actual face. You can interact with some faces by tapping to display more information, but ultimately the experience pales in comparison to the highly customizable faces on Apple and Android Wear watches. 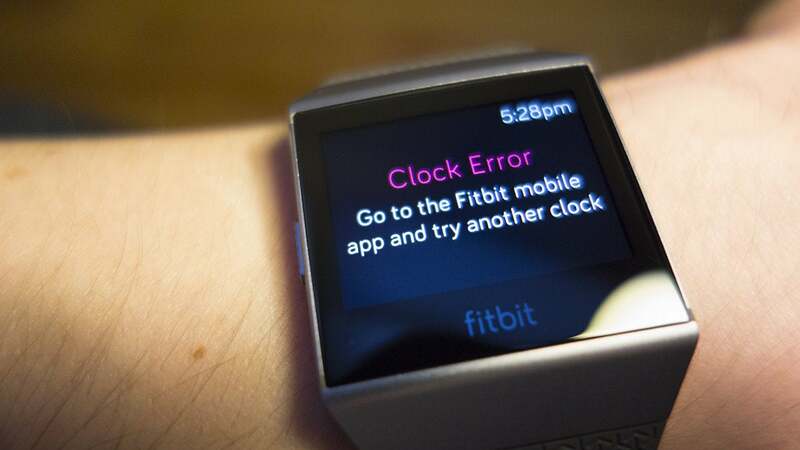 I saw Fitbit’s Clock Error so often, I started to think it was a new face. There are so few apps on Ionic, in fact, that there isn’t even a dedicated screen for them like on watchOS or Android Wear. Apps on Ionic are arranged four to a screen, and you have to swipe to get to the next set. You can organize apps on the watch by tapping and holding on an icon, but you’ll have to hit up the phone app to remove or install any of them. Ionic can play music, and Fitbit’s new Flyer buds are a great way to listen to it. One app you won’t be removing, however, is Pandora. While every smartwatch offers music playback in some form, Fitbit has teamed up with Pandora to offer offline playback on Ionic, and the integration is pretty slick. You’ll need a Plus or Premium subscription to use it, but those that do can select up to three stations to sync. Then, whenever your watch is plugged in, the app will update with fresh tunes. Each playlist contains 60 songs, so there will be more than enough tunes for several days of exercise. 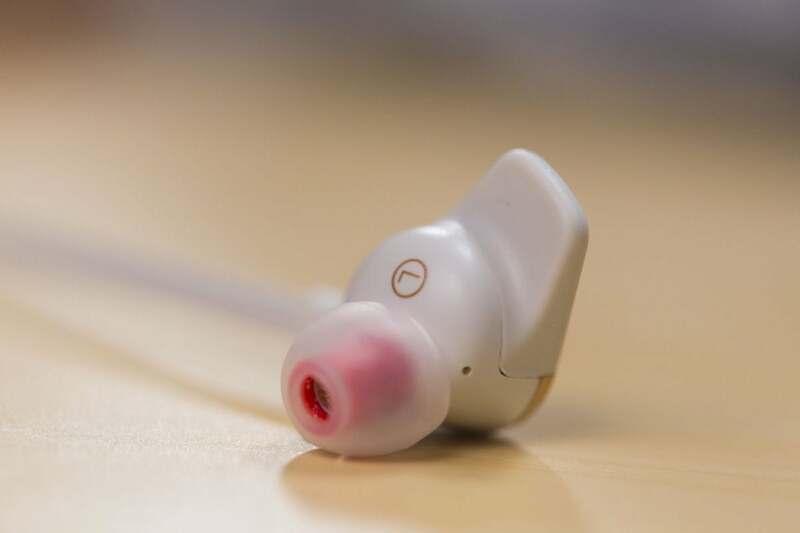 There’s no speaker on Ionic, but if you pick up a set of Fitbit Flyer earbuds, they’ll pair quickly as soon as they’re near your Ionic, much like Apple’s AirPods. Without an LTE chip to stream 40 millions songs like Apple Watch Series 3 can, Ionic does a nice job of simulating the random fun of streaming radio. You can also add your own music, but it’s a lengthy, convoluted process. And what’s the fun in that anyway? Fitbit Ionic bottom line: Should you buy it? 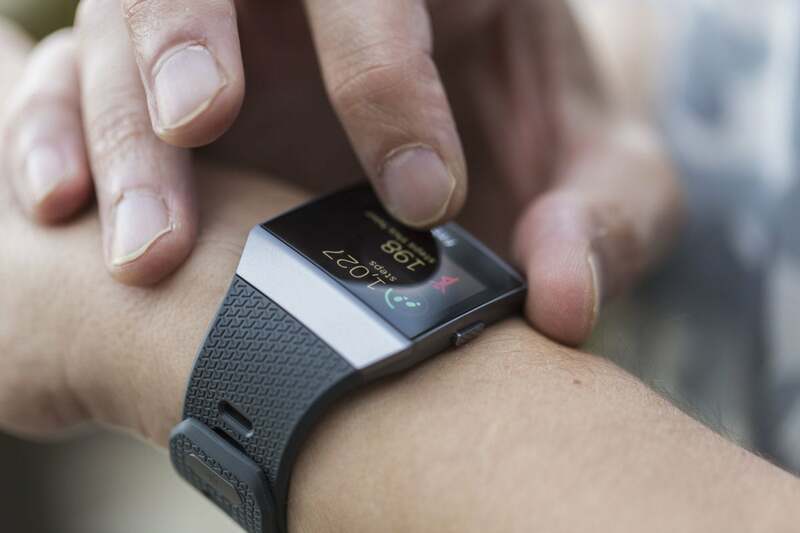 Fitbit has established itself as a leader in wearable fitness, and Ionic only solidifies that position. It has an excellent array of sensors for tracking your fitness and movements. It has Pandora integration and Bluetooth support for headphones. Its battery life is stellar. You don’t have to be an athlete to rock an Ionic, but it helps. But in its current incarnation, Ionic is really just a fitness tracker that hopes to one day be a real smartwatch. But it needs to get that chance first. At $300, it’s only $29 cheaper than the non-cellular Apple Watch Series 3, and there’s really no comparing the features on the two. They both have their strengths, but truth be told, I’d much happier using my Apple Watch as a fitness device than Ionic as a smartwatch. But then again, perhaps I’m not Ionic’s demographic. After all, I’ve never struggled to push a bike up a hill while wearing my Apple Watch because my legs refused to work.